Cup Characteristics: Notes of cinnamon and pumpkin abound. Cup is like the ‘nip’ in the air during Northern autumns. If you live in the Northern Hemisphere then you know that there’s nothing like taking a drive out into the country to look at the fall leaves in their vibrant autumn colors. Among the other seasonal offerings farmers turn out in roadside stalls throughout Canada and the US at that time of year, the vegetable that usually garners the most attention are pumpkins. And if you are lucky enough to live anywhere near Greene, Rhode Island you will understand why. You see, it was in Greene that a Pumpkin aficionado named Ron Wallace recently grew himself a world record breaking 2009 pounder! It that’s not enough to get you to pull off the country road you’re driving down we don’t know what will. The wonderful thing about Pumpkin is that although most people simply carve them into Jack-O-Lanterns, in the right hands they can be prepared into the most delicately flavored soups, appetizers, main courses, and desserts. In fact the inspiration for this tea came from a spicy piece of pie our Master Taster requested seconds and thirds of at a roadside café in the heart of Pumpkin country. He decided that the unique profile of spiced Pumpkin could be best captured by creating a base blend of high quality black tea. This seemingly unlikely base blend actually balances out the palate of flavors in this tea quite perfectly. The herbal character of the Rooibos tends a mellowness that doesn’t overpower the subtle tones of our all-natural Pumpkin flavoring while the astringency of the black tea helps open the spicy tones of cinnamon, an integral component of the blend. The next time the mercury begins to dip, try a pot of this wonderful tea. The tantalizing flavor of spiced pumpkin is sure to warm the insides and keep you coming back for more. 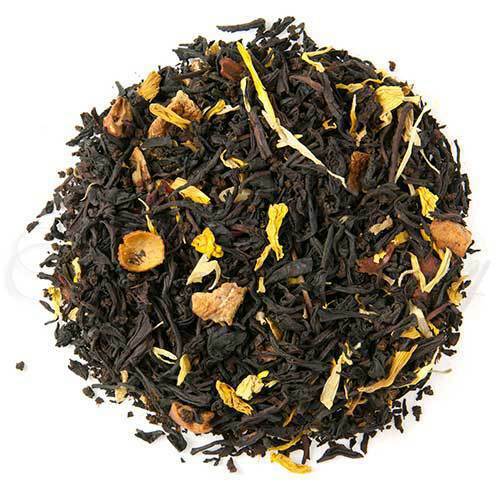 This is an absolutely amazing tea that harkens to the open road in autumn!